Learning to play electric guitar is a fun and rewarding experience. Here, I give a run down of some great entry level options for the new player. How exciting! You’ve decided, without doubt, that you’re going to take up playing the guitar. So, you’re mentally ready, but do you have the gear to actually start? Let’s ease you in to it, with our top 5 choices for an entry level guitar! 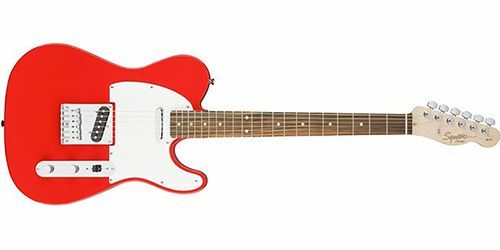 Squier is the daughter brand of Fender, so this guitar is straight away going to be good news, even at its low price! 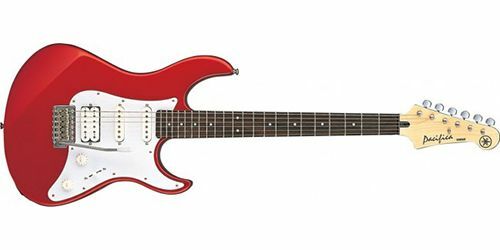 It is certainly one of the most popular entry level guitars, and you only need to play it to know why. 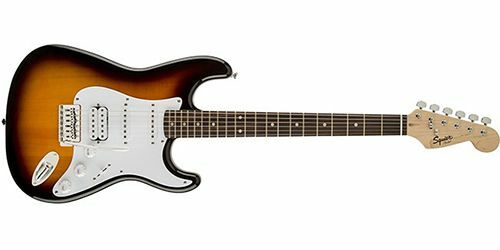 The Bullet Strats share the same well-loved look and sound as the classic Stratocasters. I can hear you asking “so what’s the catch then?”. Well, there’s no catch as such. For the price, it’s just that cheaper materials are used and that these guitars a more mass produced. The main difference with this and the Strats is the choice of wood. Instead of using Alder, Squier use basswood. Though it’s a cheaper wood in comparison, basswood gives a very even tone across the frequencies. Just like the Strats, however, this guitar has single coil pickups (single coil pickups give a bright, glassy tone), and with the bolt-on neck, you get that bright tone with the fast attack. With the five-position pickup select switch, this guitar real is a taste of the real deal, and you will not be disappointed as a beginner! 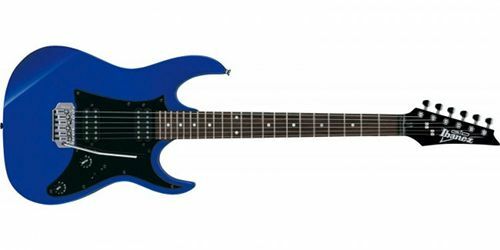 Unlike Fender and Squier, Yamaha aren’t necessarily known for being top league for guitars, but they are certainly known for making one of the best budget guitars around. In terms of look, it is like the Strat. The wood used is Agathis, which like basswood is a more budget wood, but is comparable to mahogany in terms of tone (warm and deep, but not as dark). If you’re really torn between the 012 and the Bullet, here is where you may be able to make your decision. Instead of 3 single coil pickups like on the Bullet, Yamaha have swapped in a humbucker, which means the humbucker can give the body of the tone while the single coils sit further back in the mix meaning reduced buzz, and a more diverse tone. Like the Squier Bullet Stratocaster, the body of the GRX20 is basswood, with a maple neck and rosewood fingerboard. A big difference between the two, and with the Yamaha Pacifica 012, is that Ibanez have equipped the GRX20 with dual humbucker pickups, which suits a heavier tone for rock or grunge. This guitar is smooth to play, with a thin neck and quite low action which is particularly suited to beginner players. This guitar feels built to last, which is a something you don’t always get with guitars at this price. If you’re leaning towards being more of a rock and metal player, I’d say this is your guitar! For those of you not looking to play as much heavy rock as on the GRX20, this guitar could be the one for you. The Fender Telecaster was the first successful electric guitar, and you can feel the legacy when you play any Tele. Like on Stratocasters, the body is made of Alder wood (differing from the basswood on the Bullets), with a maple fretboard. The guitar has a solid setup, two single coil pickups with a three-way selector, with two knobs for volume and tone. The guitar has a bright and crisp tone, but some people have claimed to have a bit of a buzz on their Squier Affinity Tele, and the tone is not much something to write home about. However, having said that, through a good amp / system, and assuming it is used with pedals, this does not matter whatsoever. For a beginner guitar, this would be a very confident choice. The hardware holds up, and it has a strong body, and with a good system and a couple of pedals, it isn’t easy to tell the difference between this budget guitar and some high-level guitars! The G-400 is the most expensive guitar on this list, but I absolutely had to include it because of its popularity! For what is a ‘budget’ guitar, you’d struggle to find anything better. 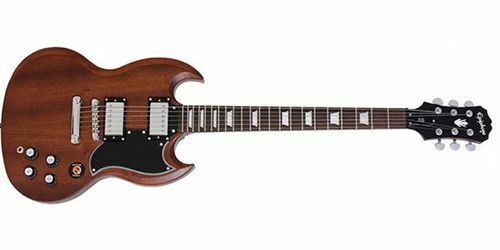 The G-400 is based on the SG, which was introduced in 1961 and quickly named the “fretless wonder”, but this is certainly more affordable. The body of the G-400 is mahogany, which gives a solid, punchy tone with some pretty decent high-end. A key element that sets this guitar apart from the others in this list (aside from the look! ), is the two Alnico Classic humbucker pickups, which are designed primarily to give you that vintage sound, and these grant the guitar a nice, crisp response. For the extra price, you can certainly feel that added quality in the hardware, with the Lockton™ Tune-O-Matic bridge keeping your intonation solid. Unlike the other guitars in this post, the G-400 has a set neck, which feels more firm, and produces a warmer, fatter tone than bolt-on necks (as the other guitars in this list have). I’d always suggest coming in to the shop to have a play for yourself before you make a final decision, so come into Wembley and see us! Do you think there’s another guitar that should be included in this list? Join the conversation on Facebook and Twitter!